What do you get when you cross a chef with a designer, adding a little play to spice things up? Well, here at the TED Conference this week, I've found that this particular combination results in sheer magic. 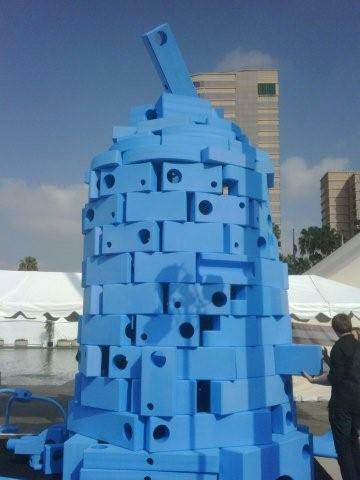 This week I arrived in Long Beach to join my colleague David Rockwell as we unveil Imagination Playground™. As you may know, Imagination Playground™ is a great new concept in play that KaBOOM! and Rockwell Group have teamed up to introduce to kids and communities nationwide. Based on the idea of loose parts, Imagination Playground™ helps children make unique connections with the world around them, by facilitating new levels of agency and creativity with each visit. What seem like innocuous blue foam blocks, turn into something extraordinary when a child begins to manipulate and imagine and create. We've found that adults really like them, too. For the past two days, two sets of Imagination Playground™ blocks have been displayed in the plaza just outside of the main theater. Completely without context, conference attendees – ranging from business leaders to scientists to designers to actors to musicians – stopped to investigate the strange light blue structure that lay before them. And then they started to play. Working together to create structures, both familiar and foreign, conference attendees really got into the concept. Check out one of the structures below. This conference is giving me so much confidence that we are working on something beyond amazing that the world is about to discover. At least here at the TED Conference, folks are beginning to recognize the potential of this fantastic new concept, which provides kids with new opportunities and worlds to explore – at school, at home, at a park, anywhere and everywhere. 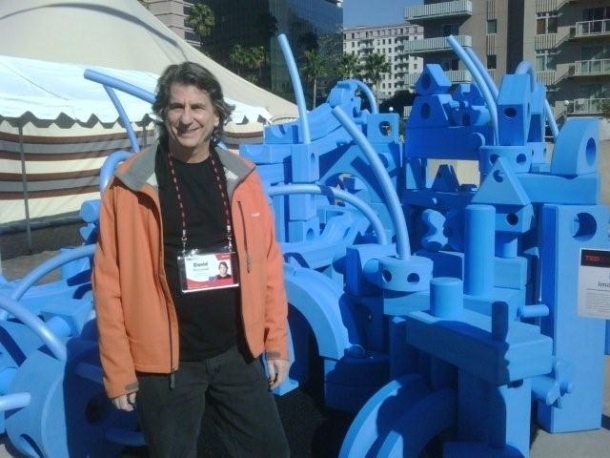 I can't wait to see David's presentation in a couple of hours, as he discusses the importance of play and how ideas like Imagination Playground™ can work to give the world what it needs. Now.